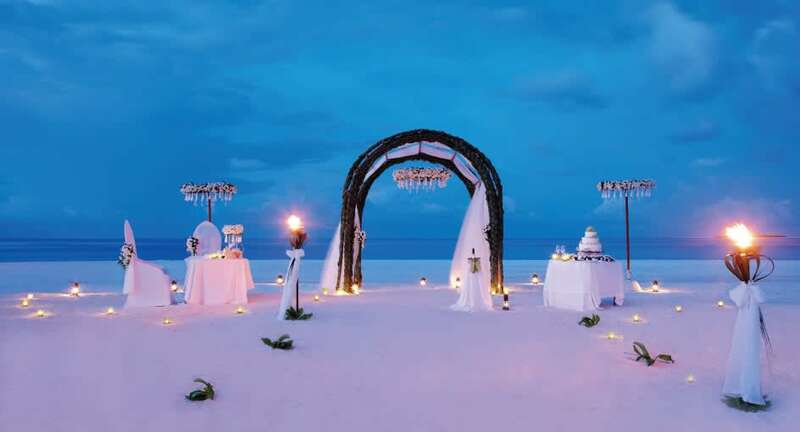 Say your vows on a pristine stretch of beach overlooking the Indian Ocean. Your special day commences in style with your every need being taken care of by our expert beautician. Take your vows surrounded by the breathtaking Indian Ocean and floral décor inspired by the resounding paradise. Toast your union with Champagne and cut your wedding cake with private photographer on hand to capture every precious moment. Share a romantic wine dinner under a starlit sky and awaken as newlyweds to breakfast in bed, a truly decadent start to your lives together. Rates are subject to 10% service charge and 12% GST. The wedding ceremony is only symbolic in nature and is not legally valid. Wedding and ceremonial arrangements can only be finalised after a minimum stay of two days at the resort to ensure preparation is sufficient. Wedding bookings must be booked at least two weeks in advance of the arrival date. Wedding package rates are not inclusive of accommodation or meal plans. Wedding rings and bridal gowns will need to be supplied by the bride and groom. Alternatively, traditional Maldivian garments are available for hire in Male. NO DRONE POLICY: Due to privacy and safety concerns, please note that Anantara Kihavah strictly prohibits the operation of drones by guests on the resort.